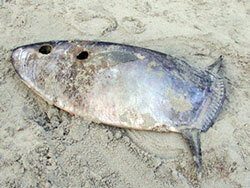 A specimen from the most elusive genus of sunfish, Ranzania, was spotted April 11th 2008 off the Atlantic coast of South Africa on the Cape Peninsula at Scarborough Beach. Jules de Combs spotted the wondrous slender mola, Ranzania laevis and sent in a sighting and some photos. These sunfishes described by Pennant in 1776 are rather diminutive as far as molas go--growing no more than about 100 cm. They are capable of great speeds however and have been caught by fishermen in Hawaii who were trolling for skipjack tuna. For accounts of Ranzania in South African waters, see Heemstra, P.C., 1986. Molidae. p. 907-908. In M.M. Smith and P.C. Heemstra (eds.) Smiths' sea fishes. Springer-Verlag, Berlin. We are collecting genetic tissues of these animals for populations analyses so if you ever come across freshly dead ones, take a small sample freeze it and contact us.